Texas has enjoyed temperatures over 100 degrees for the last few weeks. It's hot. Really hot. Perfect time for watermelon. 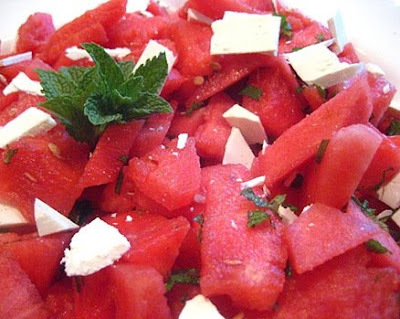 One of my favorite food blogs, Stacey Snacks, featured this watermelon salad about a week ago. I was apprehensive about the combination, but I tried it, and it is delicious!!! Perfect for a summer bar-b-q. Thank you, Stacey. Watermelon Salad 1 seedless watermelon sliced into bite sized chunks (rind removed) Handful of mint leaves 1/2 cup ricotta salata cheese, sliced thin Dressing: 3 tbsp of red wine vinegar juice of 2 limes 2 tbsp of lavender honey zest of the 2 limes Place watermelon in a large bowl and drizzle with dressing. Top with mint and cheese. Serve and enjoy!